Do you have an upcoming litter? Have you thought about the genetic testing that you will need? It is important to plan ahead to save time and money, but also to ensure that you get results in time for sending your puppies off to their new home, each with a Canine Genetic Health CertificateTM. By testing your dams and sires before they are bred, you will be able to avoid genetic disease in your puppies. As you plan your breeding, you can select to breed any carriers for a particular disease to a clear (normal) dog for that same disease. Although you are likely to produce carriers, for recessive conditions you will not produce pups at-risk for these diseases. Now that your dams and sires have been fully tested with a Paw Print Genetics breed-specific panel, you are in great shape to select Mr. Right for each of your dams. After carefully selecting your breeding pair, you now know what disease mutations your pups might carry. This is when you should start planning genetic testing for your new litters. Paw Print Genetics has litter discounts every day to help you save money while being a responsible breeder. Listed on our site are also occasional discounts and specials that might save you even more money during your planning. It is important to check our current discounts before placing your order. 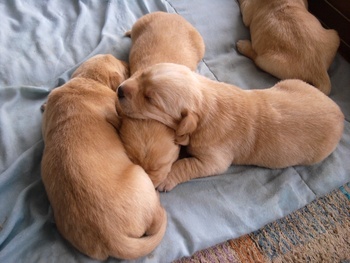 You can order prior to your pups being born, or just after the litter arrives. Please do not wait too long to order, as your results will take about 14 days from the day the samples arrive in our laboratory. If you order prior to the pups arriving, simply estimate the number of pups you expect. It is better to over-estimate because any testing kits not used can be used on a future pup or dog. Your order never expires and remains open until all the dogs in the order have been tested. If your samples arrive in batches, each batch will be reported as they are completed. So you do not need to wait to start using your order. If you order before the pups arrive, you can do the following to place your order. Note that certain fields are required to place the order and can always be updated prior to the reports being issued. First, fill in the call name for each pup and use something you can remember, like pup1, pup2, etc just to place the order. Add the litter name, for example Bachelorette X Mr. Right. Next, add the breed, select male and today’s month and year. Place your order and then start planning the sample type. Paw Print Genetics has a variety of sample types that are acceptable, including umbilical cords and dewclaws. Planning ahead will allow you to keep these precious sample types and get your results earlier. If your pups have already arrived, you can now place your order, naming the pups as you have identified them such as ‘red collar boy’ or ‘blue merle girl’. There is a limit of 20 characters on the call names, but you can get creative such as BMTG for blue merle tri girl. Ordering right when your pups are born allows you to think ahead about the sample types that you want to submit. Keep in mind that tissues such as umbilical cords allow the laboratory to get started sooner and have results to you well before the pups are ready to go to their new homes. If you have any questions about ordering for your litters, please email us at AskUs@pawprintgenetics.com or give us a call at 509.483.5950 and we would be happy to talk through your individual situation and come up with a solution that saves you time, money and frustration and allows you to focus on your new spring babies. Why Should I Test with a Breed-specific Panel?